Then, Fletcher utters the most haunting line in this incredible movie: “I think I'll try to tell him the war is over.” It’s a goosebump-worthy moment (especially paired with the still-bleeding Josey’s final response, “I guess we all died a little in that damn war”) and it is, in many ways, the movie’s true climax: The showdown that never happens. A fragile peace must coexist with wounds that may never heal. The power of this exchange is so great that it pretty much obliterates any memory of the elaborate gunfight that came not long before, at the farm. Here lies the uncomfortable heart of this disturbing and melancholy film. The Outlaw Josey Wales was billed in many ways as a typical genre movie, and it’s still regarded by some as one of those canonical early Eastwood Westerns -- from before his resurgence as an acclaimed, award-winning director. (“An army of one” was its tagline.) But it also contains some of his subtlest filmmaking, and tackles perhaps his most complex theme: How a disparate nation starts to become whole. Released during Eastwood’s vigilante heyday (he’d already made three Dirty Harry movies, as well as such revenge-driven Westerns like High Plains Drifter and Hang ‘em High), Outlaw Josey Wales begins in familiar fashion: Josey Wales is a quiet Missouri farmer whose wife and child are murdered by a rampaging band of pro-Union guerillas (also known as “Redlegs”). Battered, mourning, and pissed off, Josey joins a band of Confederate bushwhacker vigilantes. We see their brutal handiwork, along with other generalized scenes of Civil War combat, over the opening credits, set to the rousing and martial fife-and-drum of Jerry Fielding’s Oscar-nominated score. America doesn’t really exist in The Outlaw Josey Wales, at least not at first; instead we’re shown a grab bag of allegiances and mutual distrusts, with everybody recognized by their ostensible tribes; a ferryman muses at one point that he can sing either Dixie or the Battle Hymn of the Republic depending on whom he’s transporting. If one were to abandon all nuance it’d be easy to read a kind of States’ Rights apologism into the narrative: It’s worth noting that the film is based on a novel (which I haven’t read) by Forrest Carter, nee Asa Earl Carter, a former Klansman who spent much of his life fleeing his former identity as a speechwriter for legendary segregationist George Wallace. (He was partly responsible for Wallace's notorious "Segregation now, segregation forever" speech.) But under his assumed identity, Carter also wrote the sentimental bestseller The Education of Little Tree, which won great acclaim from the likes of Henry Louis Gates, Jr., and Oprah Winfrey and is still widely read today. 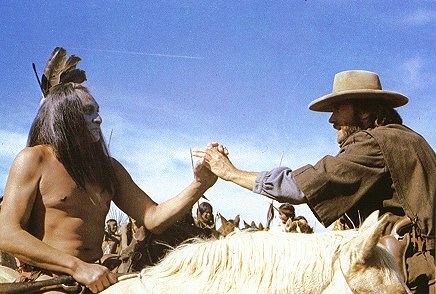 Eastwood’s film, however, goes beyond the tribalism it presents so compellingly for so much of its running time. By the end, the old woman and her daughter, having been waylaid by a band of white outlaws looking to sell them to Indians, cast their lot with Josey, who has also become riding companions with the elderly Cherokee Lone Watie (Chief Dan George) and the Navajo woman Little Moonlight (Geraldine Kearns). The wounded and broken people who attach themselves to Josey thus become not just a family for him, but almost a Noah’s Ark for the country. These folks who would ordinarily never rely on one another (and who are mostly incapable of defending themselves alone) become united through fear and mutual dependence. Even Josey finds in their embrace a kind of tolerance and peace: When they have a dance one night, he asks that they play "The Rose of Alabama," a lovely song sung to him earlier in the film by a young riding companion (Sam Bottoms) who was dying. Geography may divide us, but it can also make us whole again. So that by the time Fletcher tells Josey that the war is over, the conflict in question is no longer the Civil War specifically, but rather the fragmented puzzle of identifications and rivalries that once was America. The uneasy peace endures. And maybe Fletcher, by mentioning Mexico, is signaling to Josey that there may no longer be room here for men like them, who still carry the raw scars of a dark time bathed in violence and hate. Perhaps. In the end, we don’t know where Wales is headed after he leaves Fletcher. I like to imagine that he’s going back home, but the final shot just shows him riding, with no destination indicated. Is he headed back to the America he’s helped make possible? Or into the mythical wilderness reserved for Western heroes who can’t find their place? That’s up to the viewer to decide. An excellent breakdown of an amazing film. I would mention the other fantastic exchange that you pictured bit didn't mention between Josey and Ten Bears. It is a meeting between men. Warriors. Ten Bears will also have no place in the new America but there is the hope that his people will. Josey says point blank. I came here to die with you. Or live with you. There is iron in your words of life and death. No paper can hold the iron. It shall be life, says Ten Bears. This scene and the Fletcher scene bookend the confrontation and vanquishing of Terrell (McKinney doing his best to look like Yosemite Sam) and illustrate how small and stupid the likes of Terrell are. I only wish he could go back and get that Senator too. Thanks for the kind words. I'm awfully fond of this film, and I hope I've managed to do it some justice, however meager. It's been some five years since I last saw this film, and the two images I saved from it - that cruel family shooting at the beginning and this exchange in the end that you reported so well - they just seem too strong not to overshadow one another. I don't know, maybe the Eastwood in those days still believed in the possibility of a future after such a disgrace (or a double disgrace: the blood family and the surrogate one after that). But I can't think of all these Eastwood endings in the 70's and not remember "Million Dollar Baby", and not think that the beautiful horizon at the end is simply a better lit version of the hospital hall and the dirty window of a pie place "between nowhere and goodbye". 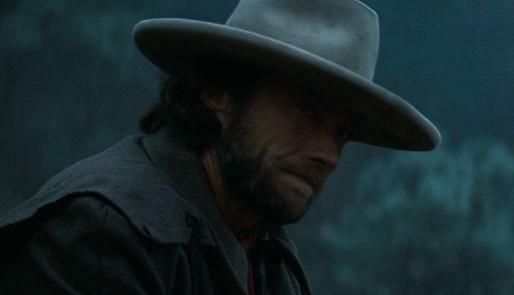 In the sense that Eastwood's men have the exact duration of Eastwood's movies: once the credits roll, the men in front of the camera get to experience their most desired destiny, which is to simply cease to exist. Whatever they've become after everything they've been through, that's something we'll never get a chance to see or even imagine, cause that's no longer them (the "them" we met for the couple of hours of projection), but someone else entirely. I can't help but think that Eastwood's cinema aims at a witness-free environment - and that means us as well as the camera. I was really moved by Wales last line in the movie. It struck a deep chord with me. 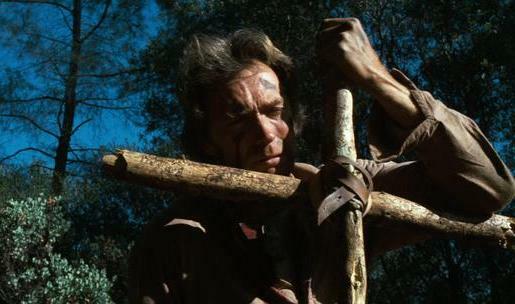 And now the Outlaw, Josey Wales has robbed Mitt Romney of his "bounce." Did it at the GOP convention, and got away, scot free. The guerilla warrior carried the fight to the enemy, and now has disappeared. No explanations, no interpretation, no comments. No comments? He actually just appeared in a nationwide GOP commercial. All the media were laughing at the senile old man with his "empty suit" routine; they don't seem to find it very funny anymore. What a marvellous film. I could sit and watch it once a week. great review! this film is on my rotating list of Greatest Movie Ever Made.